Halloween is officially over. The spooky times are behind us, and looking ahead are times of family, togetherness, warm cocoa, and (of course) major sales and bundles for November. Nintendo has wasted no time revealing some of its offerings, and announced today two special bundles for Legend of Zelda fans. First up is a Legend of Zelda: Breath of the Wild pack. 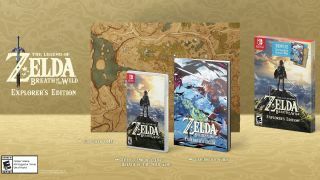 This $59.99 "Explorer's Edition" of BotW includes the base game (no season pass), a 100-page strategy guide, and two-sided map. Unfortunately, it doesn't include a console to play the game on, so you're still going to have to take your chances on finding a Nintendo Switch in the holiday shopping madness. And you will need Nintendo's newest platform if you're going to enjoy this gift; while the base game is available for Wii U as well, The Legend of Zelda: Breath of the Wild - Explorer's Edition is only available for Switch. If your tastes skew a bit more old-school, there's also a $79.99 Legend of Zelda: Ocarina of Time 3D bundle that includes a 2DS system on which to play the game. Kind of ironic to play a game with "3D" in the title on a handheld that eschews the 3D functionality, but that's just my opinion. The system itself is evocative of Link's design from the N64 classic, with a forest green faceplate and yellow buttons. These two newly-announced bundles will be available online and in US stores in time for Black Friday, but there are also special deals and gifts that will be available both before and after the monumental shopping event. For example, you can pick up a white-and-red-themed Nintendo 2DS system packaged with New Super Mario Bros. for $79.99. On November 3, a Poke Ball Edition New Nintendo 2DS XL (try saying that five times fast) will launch for $159.99 - that's not a special price or anything, but it'd still make a good gift for any Poke-fan. Lastly, a special edition of Xenoblade Chronicles 2 that includes a selection of the game's soundtrack, a steelbook case and a 220-page art book will be available for $99.99 starting December 1. A Nintendo Switch Pro Controller with Xenoblade Chronicles 2-themed markings will also be available for $74.99, also on December 1.